Welcome to my new blog! Blogspot is the third place for my blog and I hope the last one. Changes. I moved all the posts from previous website, unfortunatelly without comments. Some posts has been updated. I also transformed all old pages with furniture pieces into posts to browse them easier. I added a lot of labels and links to find different useful things faster. And I'm going to update this blog more regularly than earlier. There will be posts not only about my furniture but also about my dolls, workplace and guests. I also think about a few new series. Coupon code. New opening of the blog is an excellent opportunity for celebrating. All my subscribers receive a coupon code for my Etsy shop. If you join my mailing list today, you will get your percent discount too. Contest. For all my readers. You can win this light grey bookcase for 10-12" dolls. To take part in this contest you need to take a photo (minimal width is 800px) of your doll that the bookcase would be for and items that your doll would keep in this bookcase (doll and items on one photo). Each contestant can send only one picture at minimagine@wp.pl. I will answer all your emails so if you won't receive a reply in two days please contact me other way. I accept your entries to April 15th. There should be at least five contenders to continue the contest so let your friends know about it. Then I will publish your photos and set a readers' voting. The winner will be announced on April 30th. Have fun! Are you ready to take some photos? 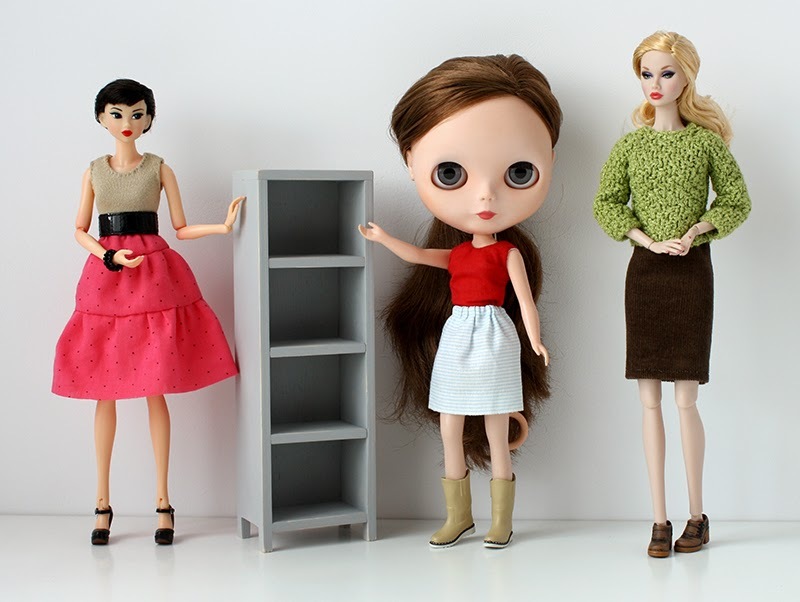 Which of your dolls will be the best to win the bookcase? PS Today is April Fools' Day but I am completely serious with all these good news. thanks for this opportunity to win the cute bookcase! Hi Milena! It's Marcela! I followed your older blog and now I'm here following the new! Just sent you my picture for the contest! I told my GF and she'll send hers too! Doing this was so much fun! Great idea! Hi Marcela! Nice to meet you on this blog too! I received the picture - thank you. I'm very glad that you like the contest.